We like to think we play a different game: more relaxed, more welcoming, more about you and your enjoyment of two great golf courses. At Archerfield preparation is just as important as the main event. Our golf practice facilities are among the best in the business allowing you to prepare every element of your game. Located in close proximity to The Clubhouse our practice facilities are perfectly situated allowing easy access to the first and tenth tee of both Fidra & Dirleton Links. 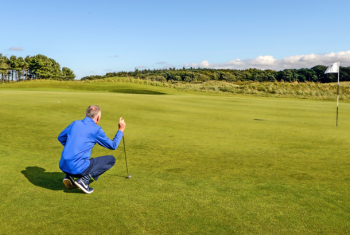 Our long game area features a duel ended driving range with a fully prepared grass teeing area at the Fidra end and a Huxley premier tee turf at the Dirleton end of the range. The fully serviced range measures 400 yards in length and is fully stocked with premium grade golf balls allowing you to practice in conditions similar to those on course. For all year practice our covered golf driving range is the perfect base with four fully stocked bays. Each bay is fitted with Huxley premier tee turf and stocked with premium grade balls ensuring whatever the weather or time of year you can practice in the finest surroundings. The short game areas are plentiful with two facilities located close to The Clubhouse, perfect to practice bunker shots, pitching and chipping. Our three putting greens are another fantastic reason why the practice facilities are regarded by many as amongst the best in the business.